The 8 Best Beer Gardens in New Hampshire! Cold beer, good company, and the great outdoors? What’s better than that? From breweries to pubs, New Hampshire’s cozy and vibrant beer gardens are the place to be when the weather is nice. 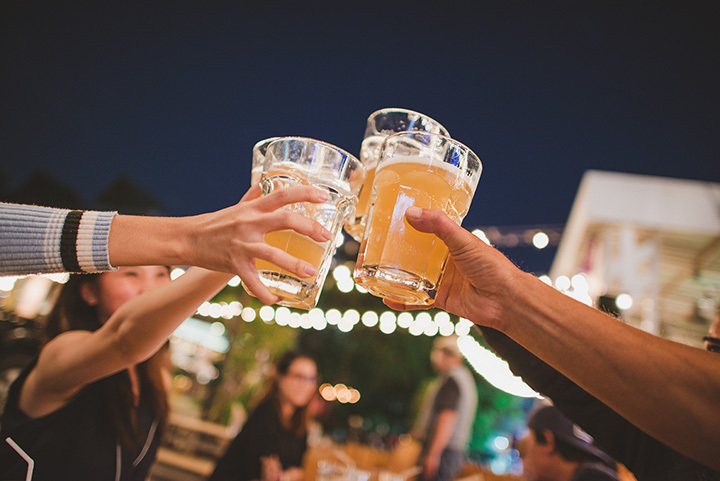 From beautifully-lit patios to spaces decorated by lush vegetation, here are the best beer gardens in the state! Earth Eagle Brewings is a gastropub and brewery with a fabulous beer garden. Enjoy local, unique brews in the heart of downtown Portsmouth. Parking can be a chore. Do yourself a favor and park at the parking garage. It’s just a couple of blocks away. The beer garden at Central Ale House is the perfect place to take a break in Manchester. Featuring handcrafted beer and more than 30 beers on tap, the food is good and families are welcome. It has a neighborhood feel to it all summer long. Visit the Stone Church for exceptional live music and a beer garden that can’t be beat. Enjoy a beer sampler—four 5-ounce pours for just $8! The atmosphere here is tops. Priding themselves on a rich history and high-quality ingredients, the Merrimack Budweiser location boasts a gorgeous biergarten in the stunning New England countryside. Not only that, but you can enjoy Beermaster Tours and an up-close look at the world-famous Clydesdale horses! The WHYM’s mission is to “help others explore and enjoy the diverse world of beer.” And they do just that. With an impressive array of craft beers and a laid-back atmosphere, you’ll love hanging out in their beer garden on a beautiful day. Whether it’s in the thick of the summer or when the crisp fall air has started to creep in, enjoying a beer outside at the Millyard Brewery is always great. Be sure to try their Clocktower Witbier—a delicious Beglian ale with spicy pear notes. Located in the cozy community of Littleton, tucked away in the White Mountains, sipping a beer at Schilling Beer Co. is quite the experience. Be sure to try their unique and delicious Belgian-style ales. Created by a group of long-time college friends, the 603 Brewery has nothing but good vibes. On a nice summer or fall day, be sure to come and hang out.